Our Opener Repair Specialists Can Help. Contact Us Today! Like any electronic equipment, the motor that powers your automated garage door will fail at some point. You may discover there’s a problem when you hear your garage door opener making a strange noise, or notice that the door operates more sluggishly. For this and many other issues related to your motor unit, Garage Door Repair Rogers is ready to help. We have a team of qualified technicians who you can trust to complete repairs professionally and within a day. You can also rely on our expertise and affordable pricing when you need a new opener. Does your chain drive garage motor make an unbearable noise when it operates? Does the belt on your belt-driven opener need to be replaced? Is your screw drive opener not operating your door smoothly? No matter what the issue is, our multi-skilled team has the training and competence to fix it. We can work on any opener type, make or model, and we follow manufacturer-approved processes to diagnose and repair your unit, making sure that all replacement parts are fully compatible. 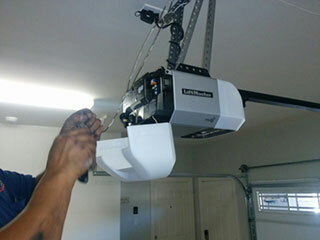 Are you considering buying a new garage door opener? Count on the help and advice of our technicians! We listen carefully to your needs and help you select a suitable motor that fits your budget. We supply a wide variety of models, including the professional ranges of the leading brands. Whether you purchase your opener unit from our company or not, you can benefit from our convenient installation service! We’ll make sure your motor is installed and working properly. Is your garage door not responding to your remote control? The solution could be as simple as changing the batteries, but if this doesn’t solve your problem, call our company. We’ll inspect your clicker, wall switch, and garage door opener to figure out the cause of the problem. We can reprogram remote controls in as little as ten minutes, or replace a damaged one on-the-spot. Contact us today to experience our excellent service!